This year I was lucky enough that my dad helped me plant a little veggie garden. And when I say “helped me plant” I actually mean, he planted it for me while I did lunges back and forth and rambled on about my cookbook and my lack lustre dating life. After nearly murdering the poor little garden several times from under watering it, (plants are so thirsty!) it’s now looking mighty fine if I do say so myself. I have been harvesting romaine, kale, oak leaf and butter lettuce from it almost daily, tomatoes and peppers are starting to ripen, and every now and then I have been lucky enough to get a strawberry or two. Little bombs of flavour they are. There is a huge abundance of fresh herbs in my garden, and when I say an abundance, I’m not kidding. My dad went crazy when I told him I like mint tea, so he planted me peppermint, mojito mint, marshmallow mint, and ginger mint. Then he planted rosemary, thyme, two different kinds of sage, two different kinds of basil, flat leaf parsley, curly parsley, chives, lovage, borage (which I decided I hate, sorry dad), oregano, dill, and chives. Whew! I mean I love cooking but that is a lot of herbage going on. If you have been following me on Snapchat (@bonappetegan) you might have seen that my geezer duct-taped together, originally bought it off of craigslist from two women who owned the fattest cat I have ever seen (poor kitty), food processor broke. Breville was so incredibly generous to send me this super fancy Breville Sous Chef 12 Plus. This is not your average food processor, this is the cadillac of food processors in the $450 range. Eek! I’m not going to lie, I was a total sceptic when I received this food processor. It can’t be that different can it? I am super happy to be proven wrong. This thing is amazingly designed and works better than I could have possibly imagined. If you are someone who owns a Blendtec or Vitamix, then you know the difference between one of those blenders, and a regular blender. The same goes for Breville’s food processor compared to a regular food processor. They just don’t compare. You can put an entire potato into this thing and slice it into thin rounds in (and I’m not exaggerating) 2 seconds. There is serious motor power! It comes with so many cool attachments which makes me geek out a little. I’m so damn excited about this food processor that I asked Breville if they wouldn’t mind if I did an honest review of it on YouTube because I just want to show you how cool it is. They ok’d it so stay tuned for that! This is definitely not a tool you need, but it is a tool you may want. 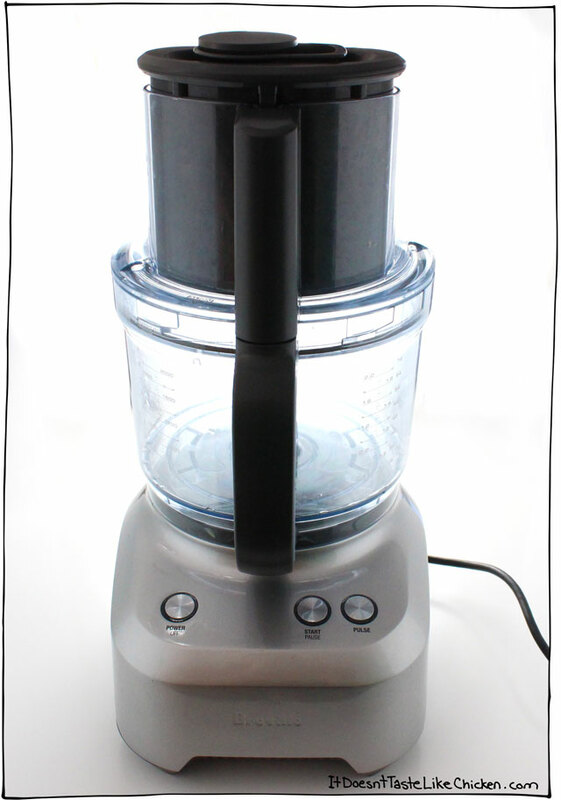 If you are looking to invest in a high-end food processor, I give this one three thumbs up. 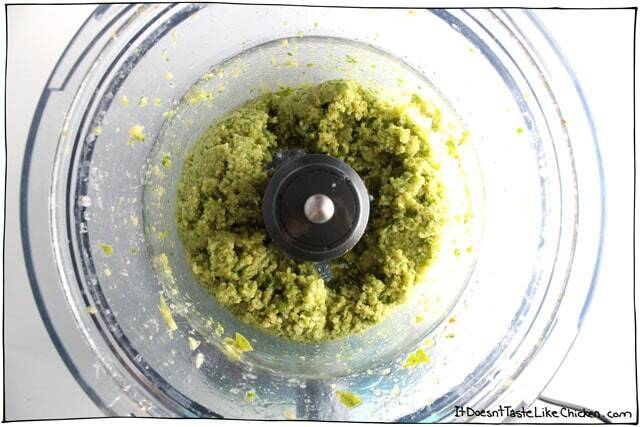 So with my dreamy food processor in mind and an plethora of herbs, I knew I had to make pesto! The most perfectly delicious way to use up fresh herbs. 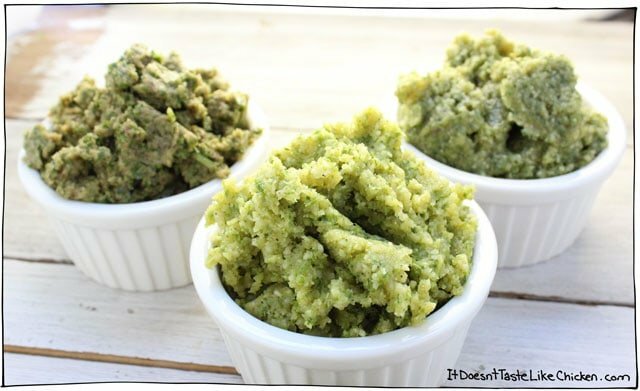 Pesto freezes gorgeously meaning you can have those fresh herb flavours on a rainy or snowy day. Love it! 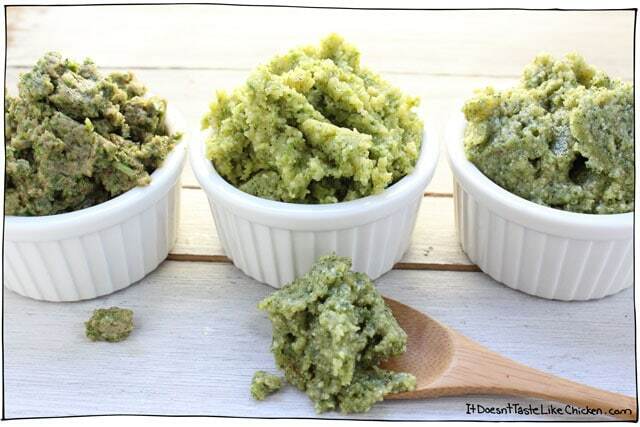 I love making my pesto’s a little thicker than standard, as it can work well as spreads on crackers or sandwiches, and can always be thinned our more if needed by adding more olive oil or water to taste. To make your pesto, choose any combo of herbs you like, along with a nut of choice. Add the remaining ingredients then blend until smooth, stopping to scrape the sides as needed. So quick and easy, my kinda recipe. I used the handy dandy smaller bowl and blade in my food processor. For the herbs you can use any combo you like, but I recommend not using more than three different herbs so that the flavours don’t get too muddled. If you are unsure if your herbs combine well together, just take a piece of each and taste them together. If you are still unsure, just use all one kind of herb! Nothing wrong with a simple basil pesto. 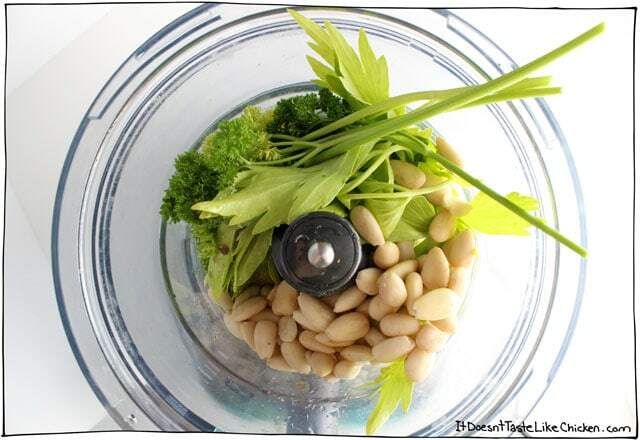 Pine nuts are standard in pesto, but since they are very pricey and I never have them on hand, I am not the hugest fan, so I love using balanched almonds, walnuts, or cashews instead. 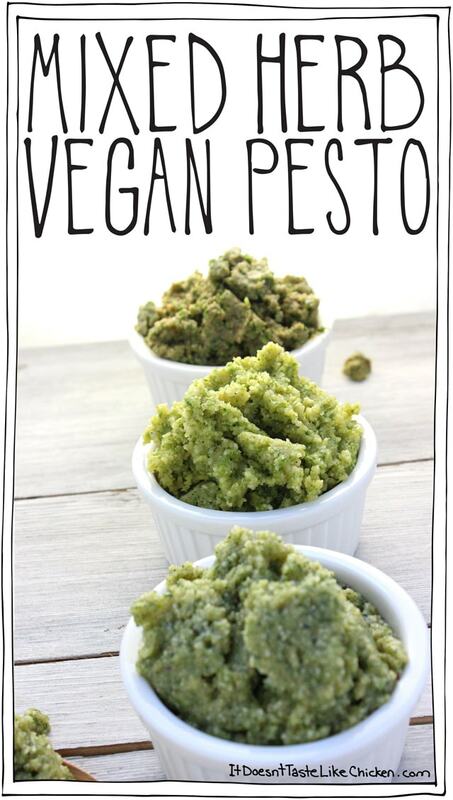 Now go get your pesto on! A DIY recipe using the herbs that you have. 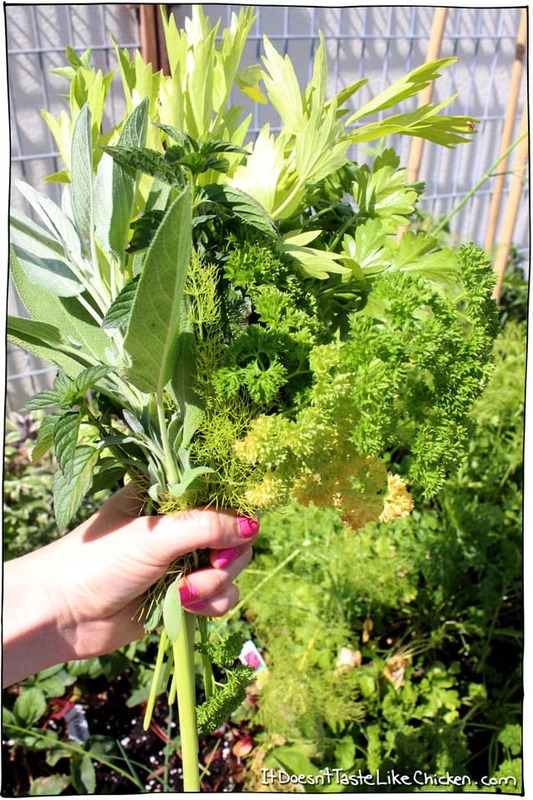 A great way to use up leftover herbs or herbs from your garden. Freezes perfectly. So delicious, I used salted cashews so I should have cut salt to 1/8 – still amazing Thank you! You’re most welcome! SO happy you enjoyed, Michelle! YUM! Pesto is absolutely the ONE thing I make every year from my garden. It is a MUST. These look delicious. The food processor looks awesome, too. 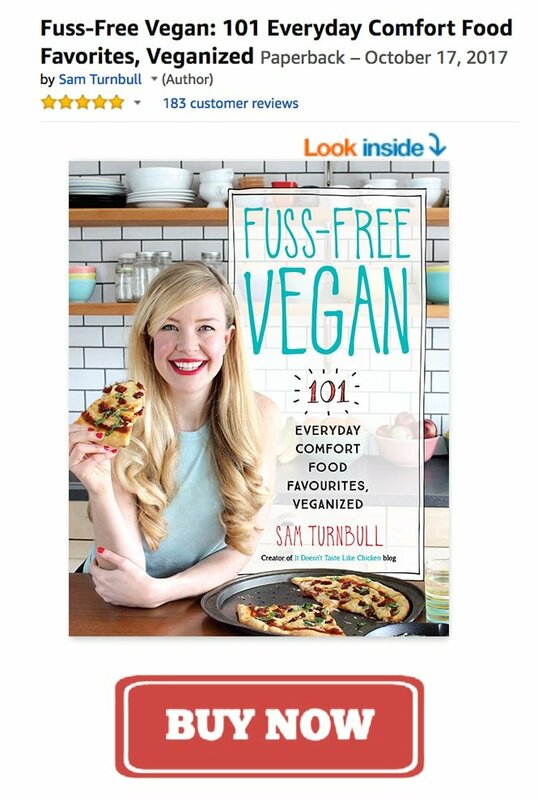 Being Vegan I would justify such expenditure because food processors and/or super blenders get used almost daily. 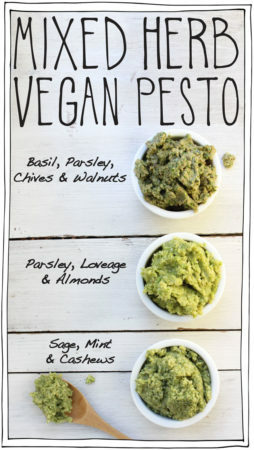 I adore pesto. I found if I made pesto with cilantro, which my husband hates, I can have cilantro flavor on enchiladas, burritos, tacos, whatever. Otherwise, a bunch of cilantro goes bad in the fridge. Never been a huge fan of pesto. But, I too have a millions herbs in my garden, so I’m gonna try mixing them up a bit. Any suggestions for a something with a number of different onions just coming on in my garden? My Cuisinart blender lost a big piece of metal from the blade into my soup. Better get a Breville!